Not long after Joshua led the Hebrews into the Promised Land, they began to walk away from the Lord. In fact, after Joshua died they “did evil in the sight of the LORD, and served Baalim” (Judges 2:11). This angered the LORD but even so He raised up judges, which delivered them out of the hands of their enemies (Judges 2:16). Each time the LORD raised up a judge to protect the people, they only strayed farther and farther from the LORD. In those days judges acted more like military leaders than magistrates. 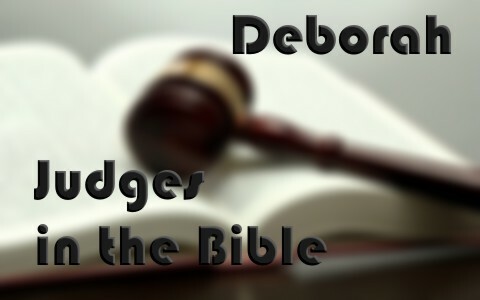 One such judge was Deborah, the only female judge mentioned in the Bible. During the time that Israel was held captive by Jabin King of Canaan, Deborah appointed a captain named Barak to come up against Jabin’s captain whose name was Sisera. When Deborah gave Barak his assignment he was fearful and said he would go fight Sisera and his army only if Deborah would accompany him. Deborah agreed to go because she knew that the “LORD shall sell Sisera into the hand of a woman” (Judges 4:9). Most notably, Deborah’s army was only 1/10 the size of Sisera’s, yet because Deborah had the LORD on her side, she was the victor. She became known as the female warrior who rescued her people. What More Do we Know About Deborah? We know Deborah had a husband named Lapidoth (Judges 4:4). And although she called herself “a mother in Israel”, there is no mention in the Bible of any children that she might have born. Deborah’s husband must have been quite supportive, seeing as she was one of the most powerful women in her day. I imagine he was hard at work behind the scenes and because of his support she was able to do what God called her to do. She was called a “Prophetess” (Judges 4:4) which means that she had a special gift from God to declare His will for the people. The people came to her for judgment because they knew she spoke as God’s representative. Interestingly, “she dwelt under the palm tree” which must have been a landmark in this area between Raham and Beth-el in mount Ephraim, because there were not many palm trees in that region. A true leader, Deborah was Judge #5 of Israel that God used to deliver them from their idolatry. This was a time when “every man did that which was right in his own eyes.” (Judges 21:25). During her reign as Judge the people lived in peace and followed the Lord for forty years. Later they returned to their evil ways (Judges 6:1). Deborah has gone down in history as a fearless and strong leader of the Hebrews. Her strength and confidence came from the LORD and because of her, the people rested from battle for forty years. She could have easily stayed behind and sent her captain into battle, yet she went with him knowing all along that the LORD would protect her. She did not just dictate what was to be done to defeat Sisera’s army, she rolled up her sleeves and joined in. She led by example. Something more to read: Who Was Jethro in the Bible? Truly Deborah proves to us that God can and will, (as He has in the past) use women for His kingdom work just as much as men. Thank you for this Pam. Deborah is such an example of a godly woman who feared only God.